There is a temptation when telling the story of anyone from a disadvantaged background to gild the poverty lily somewhat; in other words, to cast the deprivations of life on the proverbial wrong side of the tracks in some sort of rose-tinted, we-have-no-food-but-we-have-love glow. And while you can well understand the appeal of that kind of narrative approach, it doesn’t really serve to give us any sort of authentic insight into life for those at the lower end of the 99%. 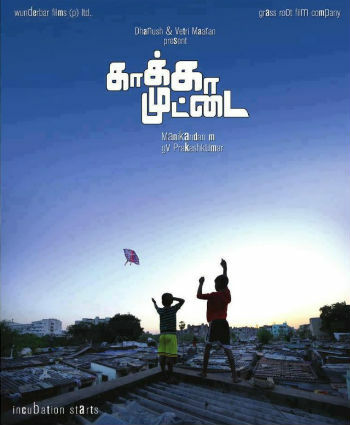 But Kaaka Muttai or The Crow’s Egg, written and directed by M Manikandan, happily occupies the latter territory in telling the story of Big Crow’s Egg (J Vignesh) and Little Crow’s Egg (V Ramesh), two brothers who live with their mother and grandmother in a 5 acre Chennai slum squeezed between freeways and the growing affluence of the city’s business district. So-named because they supplement their restricted diet of watery vegetables and rice with regular raids on crow’s nests where they gather up almost all the eggs – in an endearingly selfless twist, the elder brother insist the crow must get to keep at least of its eggs – and eat them, the two barefooted spend their days gathering coal to assist their world-weary young mother who is doing her best to keep the household afloat while her husband is in prison. It’s not an easy existence in any way shape or form, and while the boys are a delight – the elder brother is more circumspect and serious but still capable of a smile while his younger sibling is far more mischievous and apt to celebrate the small fun parts of life, rare as they are – and there are some touching moments with their grandmother (Shanti Mani) particularly, life is brusquely defined by a hand-to-mouth timetable that leaves no real time for play or school. Even so, as children always do, the two boys still manage to find enjoyment in their lives. Whether it’s talking to their amiable railway worker friend “Fruit Juice” or stopping by to talk to their well-dressed, toy-and-food rich middle class friend who is never allowed to leave his gated compound (nor are the boys allowed to enter it), there are some small joys to be had. But these are never presented as the be all and end all of the boys’ existence; rather that despite everything their spirit somehow remains diminished, and they approach life with the joie de vivre of two young people who are yet to fully appreciate that life doesn’t always give you everything you want. This unspoiled-by-life optimism shows itself more dramatically when a government program to give away TVs at the ration store – an odd giveaway that smacks more of distracting people with “bread and circuses” that assisting them with any meaningful change – gives them entree into a world previously denied them. One that includes ads for Pizza Spot, a fast food chain expanding rapidly throughout Chennai that appears to offer them Nirvana in the shape of a glistening slice of cheese-topped pizza. It soon becomes their obsession to get this mysterious new food for themselves and they devote a considerable amount of effort to sourcing the considerable amount of money to buy a pizza, and the new clothes needed to make them “worthy” enough to enter an eating establishment clearly geared only to India’s burgeoning middle class and their newly-disposable income. But an unfortunate incident when they try to enter the establishment they have so long treated as the promised land makes them wonder if they can ever have all the good things that glisten almost unattainably out of reach on the road across from their slum. The Crow’s Egg is, for the most part, an absolute joy to watch. The boys’ irrepressible spirit in the face of a host of reasons that should have well and truly beaten it down, the warmth of their relationship with their exasperated mother and melancholic grandmother, and their willingness to do whatever it takes, short of breaking the law (they may bend it a little) endear them almost instantly to an audience. 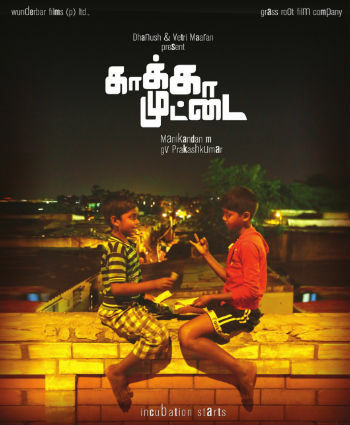 The film’s only downside is that it spends far too long in the second act taking the action off the boys and placing it on the villains who seek to take advantage of the boys situation, and the Pizza Spot owners who don’t have much of an appetite for Little and Big Crow Egg’s desire to join their middle class brethren in junk food heaven. They have a role to play in the film, and the finale, ripe with ironic amusement, would not succeed without them but far too much time is spent on the set-up and not enough on the delivery, leaving the boys, who are the heart and soul of the film out of the action for far too long. 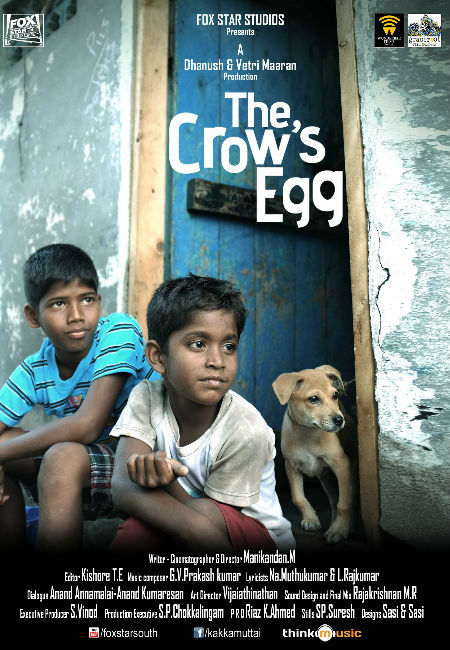 But this one narrative misstep aside, The Crow’s Egg is one of those whimsical joyous films that still manages, despite an authentically grim setting, to impart a sense that even in the most dire of circumstances the human spirit can still find a way through, even if life doesn’t offer up the rarely-glimpsed fairytale ending.